The complexity and detail of geometric scenes that are used in today's computer animated films and interactive games have reached a level where the manual creation by traditional 3D modeling tools has become infeasible. This is why procedural modeling concepts have been developed which generate highly complex 3D models by automatically executing a set of formal construction rules. Well-known examples are variants of L-systems which describe the bottom-up growth process of plants and shape grammars which define architectural buildings by decomposing blocks in a top-down fashion. 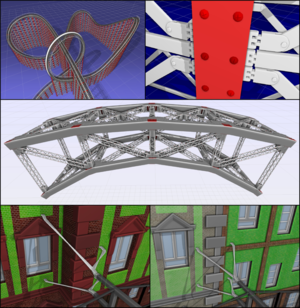 However, none of these approaches allows for the easy generation of interconnected structures such as bridges or roller coasters where a functional interaction between rigid and deformable parts of an object is needed. Our approach mainly relies on the top-down decomposition principle of shape grammars to create an arbitrarily complex but well structured layout. During this process, potential attaching points are collected in containers which represent the set of candidates to establish interconnections. Our grammar then uses either abstract connection patterns or geometric queries to determine elements in those containers that are to be connected. The two different types of connections that our system supports are rigid object chains and deformable beams. The former type is constructed by inverse kinematics, the latter by spline interpolation. We demonstrate the descriptive power of our grammar by example models of bridges, roller coasters, and wall-mounted catenaries.